Image by kpishdadi via FlickrAs I set the table for Thanksgiving this year, I set a place that I knew might go empty. Our son Noah, a police officer, was working but hoped to be able to drop by for dinner. It would not be the first time we have had an empty place setting at a holiday table. When our oldest daughter was in out of town at law school, her exam schedule did not afford her the luxury of a trip home for Thanksgiving. When our son was deployed to Iraq, his setting sat unused. 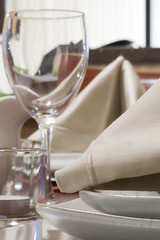 There is something important to me to put those dishes on the table, even though I know they will not be used. They are the promise of another holiday to come when that person will rest their feet under my table and share the special day with us. There is someone else preparing a place that has yet to be used. The Lord Jesus told us, "Let not your heart be troubled: ye believe in God, believe also in Me. In My Father's house are many mansions: if it were not so, I would have told you. I go to prepare a place for you. And if I go and prepare a place for you, I will come again, and receive you unto Myself; that where I am, there ye may be also," (John 14:1-3). He is waiting for us to take our seat at His table and eat bread at the table of the king forever. What a glorious thought that we are on His mind and He is preparing a place for us in this very moment. The Language of Love, will be dedicated to communication between husbands and wives, viewed through the context of the Scriptures. While communication may be the hallmark of any marriage, communication --or lack thereof-- is evidence of the attitudes held by the participants. The Scriptures tell us this is true, "But those things which proceed out of the mouth come forth from the heart" (Matthew 15:18). Attitudes are one of the most susceptible areas where our enemy can sneak in and plant thoughts and suggestions which, if allowed to take root, will grow huge trees of bitterness, apathy and discord. For the husband, he can be tempted to have an attitude of apathy -- of not caring about the particulars of what interests his wife, or even sometimes the home. Perhaps other interests, hobbies or friends are tempting him away from the time and consideration involved in caring for, leading and guiding his family. One of the greatest temptations for the husband is to not lead. And if the husband won't lead, the wife usually will. Using the excuse that "she's so much better at that", he will often let her make all the decisions. Or perhaps he gives in to the wife because he doesn't want to encounter disappointment and coldness which may greet him if he does exercise his God-given authority. A weak husband, one who lets his wife and his children do what they want regardless of his misgivings, almost always spells trouble for the family and the marriage. The husband speaks to the world of Christ's relationship to the church, and by being detached or apathetic, he portrays a false picture of the loving, gentle Servant-Leader our Lord was and is to His church. One of the greatest moments in our marriage was when I realized I had been usurping my husband's authority in our home. I had been quick to make decisions even without consulting him for his opinion, but I felt the conviction of the Lord that I was wrong in doing so. Immediately I began to let my husband make the decisions and it was if a huge weight rolled off my shoulders. I have joked to others that I let him make the decisions and that way if they are wrong, I don't have any of the responsibility for them! Letting my husband be the true authority in our home doesn't mean that I don't have a voice in the decisions that are made. My husband often asks my opinion or seeks my advice in matters. But the final decision is up to him, not me. He knows he can't say, "Well, you just decide what you want," because I'm not going to do that. I'm going to leave the decision to him. I believe the Lord has blessed us for following this path and I know it has been a great blessing to me personally. Wives have their own temptations as well. Not only can wives be tempted to pick up the reins of authority if their husbands lay them down, wives can often be tempted to the root of bitterness growing in their hearts. Once allowed to start, this evil root is hard to pull out. We have a small growing vine on the side of our house. It grows up the bricks and across the front of our house. The little vines cling and stick to the bricks tenaciously. Once we have managed to pull them off, we think the job is done, not realizing that there is a huge root underground ready to sprout out more vines at anytime. Keeping the vines pulled down is almost impossible unless the root is completely destroyed. As wives, we must watch very carefully lest that root of bitterness begin in our own heart. We may find ourselves talking under our breath about a certain fault of our husband's -- something that tempts us to irritation. Or worse yet, we decide to tell it to another person, usually a woman. If this describes you, or you think it might describe you, you need to ask the Lord to remove the root of bitterness in your heart and replace it with thanksgiving and reverence. Since the wife is a picture to the world of the relationship of the Church to the Lord Jesus, one would never expect the Church to be complaining or gossiping to others about "faults" she has found. It is no less true that we should not be doing so about our husbands. If we have issues with our husbands, they should first be taken to the Lord in meekness and humility, "Brethren, if a man be overtaken in a fault, ye which are spiritual, restore such an one in the spirit of meekness; considering thyself, lest thou also be tempted"(Galatians 6:1). If after that, we still feel we have an issue, we can bring it very respectfully to our husband. If the issue still remains after that, we can go to our Pastor. Those are the authorities outlined for us in the Scriptures. It does no good for us to share issues with other women, but stands as an example of bitterness and gossiping to sisters who may be weaker than we are spiritually. Others may be guided by our words and actions and we must make sure that we guide them in the path of the Spirit. I came to see my bitterness as a great sin against the Lord and against His children. Thankfully, the Lord was gracious to restore to me a heart of joyfulness and gratitude. My relationship with both my husband and my friends improved and the Lord even provided a wonderful working environment for me. I know a woman who is the perfect example of a joyful wife who is always reverencing her husband. Her husband is very particular and exacting, and I know it cannot always be easy to fight the temptation to bitterness and disrespect. However, she does so and is such a blessing to everyone who comes in contact with her. Her actions and words speak so highly of the love of the church to the Lord Jesus and she is a wonderful example to every Christian wife who meets her. While we may not always be completely happy with our relationship, if we will make the choice to honor the Lord by reverencing our husband, by voicing our issues to the Lord's ears and by choosing to respond to our husband as the church responds to the Lord Jesus, the Lord will keep our heart. He will cause us to know His peace and His joy and His love in ways we could have never imagined. Our attitudes and actions to our husbands are simply an act of worship and obedience to our Lord. 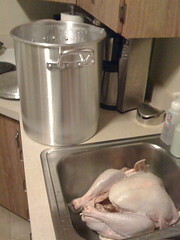 Every Thanksgiving, we brine our turkey before cooking it. Soaking the bird for hours in a bath of salt water, brown sugar and spices not only infuses flavor to the turkey, it tenderizes the meat. Last night I had prepared the brine and was ready to put the large pot containing the bird and brine into the refrigerator. My youngest daughter, who loves cooking for Thanksgiving, and her British boyfriend were both helping. This year we purchased a new refrigerator, a slightly smaller one. As I stood with the door open contemplating where this large stewpot was going to fit, my daughter's boyfriend (and our friend, too) commented on how big the refrigerators in America are compared to those in England. When I asked him what they did with all "their stuff", he replied succinctly, "We eat less." I immediately thought of all the things that Americans --and people of all nations, actually-- take for granted. We have been blessed with so much and we are thankful for so very little. Today as we are surrounded by those we love and the bounty of our tables, let us take a few minutes to think on all the "good and perfect gifts" that we have received, beginning with our very breath. Then let us thank the "Father of lights" from which all things come. It Happens Every Year. . . It happens every year, usually at Thanksgiving. By the time Christmas rolls around, I have prepared myself and it doesn't slip up on me. Image by suzukiQ via FlickrToday I was in the kitchen with my youngest daughter, preparing dishes for our Thanksgiving dinner tomorrow. The olive oil in the cast iron skillet was just the right temperature and over it I held a large bowl full of chopped bell peppers, onion and celery. As the first vegetables hit the hot oil, the fragrance wafted up to me and unexpectedly, it hit me. This smell is the quintessential smell of my childhood, of my parents. 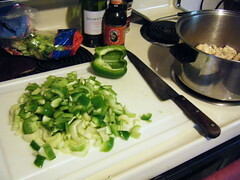 Gone thirteen years now, I can never cook a dish beginning with these ingredients without missing them deeply. It seemed that smell was the start of every special dish in our house and it was the smell of our holidays, as it is now the smell of the holidays for my own children. I was glad I had tucked a handkerchief in my apron, something my grandmother would have done, because I needed it to wipe my tears and blow my nose. The memories of our holidays past shape our present and future ones. We treasure holidays because we treasure the memories of those who are no longer with us and we treasure the times in our lives which seemed so much simpler. We treasure the rituals we have built around our holidays. These rituals are part of our past, part of our spouses' past and even a blend of new rituals we have developed with our own families. We cannot forsake the celebrating the holidays because they exist as an honoring of what has gone before and the hope of what will yet come. For me, the knowledge that my parents will never be forgotten in my holidays, especially as long as celery, onions and bell peppers are thrown into a hot pan of olive oil, is comforting. Even once I am no longer able to cook those things which produce the heart-rending smells, I have confidence my children will, and they will remember me as I remember my parents. I wish you each a very Happy Thanksgiving and a wonderful Christmas season. This is the Day. . . It is so tempting to think of tomorrow, or the next day, or any day in the future as when we will know peace, contentment, joy or happiness. The truth of the matter is that we have only this day to know the "life more abundantly" the Lord has promised us. None of us is guaranteed tomorrow, next week, next year, or even our next breath. Even if we were, what makes us imagine that if we can't experience the peace of the Lord in this moment, we will know it any more clearly in the future? We imagine that we will be absent of this worry, or this difficulty, and then we will know peace. Our problem is not time, the future will bring it's own worries and difficulties. Our problem is perspective. We fall into falsely believing that circumstances can make us joyful and at peace. In fact, only a Person -- only THE Person -- can cause us to know "joy unspeakable" and if we have trusted in Him as Lord and Savior, He is ours in this and every minute. We have no need to wait for tomorrow. Image by Marcos Vasconcelos Photography via FlickrIt is our choice to thank the Lord for this day, this very moment -- troubles included, knowing that He can and will be all our trusting hearts need, even in the very troubles we seek to avoid. Often He desires to meet our need not by taking us out of the trouble but by meeting us in the trouble. So let us choose to "rejoice and be glad" in this day. Let us choose to worship Him with our sacrifice of praise and obedience to walk in the Spirit the path He has placed before us, storms, troubles and all. When we first read this beautiful declaration from David we think of prayer and of David's determination that he would pray "evening, and morning, and at noon", and this is a wonderful inspiration to receive from this verse. There is also something else wonderful in this passage, the truth that the we have immediate access to the Divine Ear. I work at a very unusual hospital. It was founded by a husband and wife who wanted to establish a hospital that was very family-oriented, not just from the viewpoint of the patient, but from the staff as well. They wanted the staff to feel like one big family. I was amazed as a new employee to hear others call the Director of Nursing (as they were called back then) and even the Vice President of the hospital by their first names. Never had I been employed by a hospital like that before! I came to find out over the years, that every employee had access to the offices of the Chief Nursing Officer (as they are now called), the Vice Presidents and even the President of the hospital. There have been times I have walked down to Administration, stopped at the secretary's desk to see if the President was in and then immediately walked into his office to talk with him about one issue or another. He would not be surprised for me to call him by his first name -- in fact I think he might be put off to be called "Mr." after all these years. This open door policy has been quite surprising to most new employees and also gives a feeling that those in Administration really care about the staff, and I know they do. The want to "hear our voice" as it were. Let us keep these thoughts foremost on our minds. Our Lord, the very God of the universe, delights in our prayers. He gave His most beloved Son that we could have immediate access to His throne anytime, anywhere for anything. Communication is perhaps hallmark of any relationship, and in marriage it is essential. Not only is communication with our spouses important, communication about our spouses is vitally important as well. I have a friend who insists on telling me something negative about her husband every time I am around her. Now, I know her husband and he is a wonderful person. Her telling me negative things about her husband does not make me think badly of her husband, in fact, it reflects negatively on her. We would never find the Lord Jesus criticizing the church to anyone, nor would we find the true church finding fault with the Lord Jesus. However, we have enemies who greatly tempt us to do so with our spouses. How easy it is to make a negative comment, to slip a "witty" jab in conversation, or to throw out a barbed "joke"! But these things not only reflect negatively upon the person speaking, they reflect negatively upon Christ and the church. The Christian wife who truly wants to honor the Lord, must first choose to honor and reverence her husband. (Ephesians 5:33) One of the first ways to do this is to find ways to affirm him. Now, believe me, as soon as we decided to do this, our enemy will begin to point out every flaw and dent in our husbands' armor. But we must make the choice not to fixate on those things, as Paul said, to know no man "after the flesh" (2 Corinthians 5:16). We must choose to believe what the Lord has said is true about our husbands in the spirit and affirm those things. Let's look at that idea more closely. Perhaps he leaves his dirty socks in the middle of the floor. But did he work today to help pay the bills for the household? That is something that surely can be affirmed. "Thank you honey for working so hard for us." These affirmations need not only be in private. Just as women tend to want the fictional "romantic hero" to sweep us off our feet, men want the fictional "adoring woman" to stand up for him and support and affirm him in public. They want to feel certain that we are the biggest cheerleader on his team. And we should be. Tearing our husbands down -- to him or to others -- is never pleasing to the Lord, but is clearly something influenced by our enemies. As Christian women, let's ask the Lord to show us places where we have failed to reverence and affirm our husbands. Let's ask first the Lord's forgiveness. Perhaps the Lord will lead us to ask our husband's forgiveness, too. Then let us ask the Lord to open our eyes to all the ways we can affirm and support our husbands. One way this happens in our house is we have a rule, "No Men Bashing Allowed." Women who enter our home and start to bash on men are usually told by me, "My husband, my son, my father and my Lord are all men. I don't allow men bashing here." If we make our homes a safe haven for our husbands, we will be the one to benefit the most and we will glorify the Lord in doing so. So what is it that women need in a Christian marriage? Women need to know they are truly loved. Not just a quick, "I love you", but a true sacrificial love. This means that the Christian husband who wants to honor the Lord in his marriage must first choose to love his wife as himself. (Ephesians 5:33) He must decide to give the time and attention and caring to those things his wife cares about, whether he personally is interested in the thing or not. The Lord Jesus intimately cares about every detail of the church's life to the point He has numbered every hair on every head. The husband must have the willingness to be intimately involved in the cares of his wife. Let's look at that thought a little closer. Perhaps a husband comes home and the wife has completed a bothersome project that day. She proudly wants to show it to her husband. He may be tempted to briefly look and turn his attention elsewhere. The heart of sacrificial love though, will stop to look at the details and listen --truly hear -- the things the wife has to say about the project. In doing so, he will say "I love you" in a greater way than any Hallmark card can ever express. Men are often good at this during courtship, but after the wedding ceremony sometimes lose the incentive to be as interested in the things in which their wives are interested. I remember a Christian wife one time telling me her husband would never notice anything she had worn, that he had no comment or even apparent recognition of her apparel. How sad this is, considering the evident care she had taken in getting dressed. Love and reverence. . .two of the things the Christian couple is called to fulfill in marriage, can be such a pleasure to each other, and surely a pleasure to the Lord. When we obey the Lord in that which He has called us to do, we worship Him in the greatest way possible. In the beginning God created . . . The very fact that of our existence is not a chance, not a random occurrence by the blending of gases and molecules, but a choice. . .a choice by God. The Lord God made a choice to create each of us. He has not made us in vain. He continues to work in each of our lives that which is "well pleasing in His sight" and to do and to will of "His good pleasure." Although created "a little lower than the angels", He has crowned us with "glory and honor" and given His most beloved Son that we might dwell with Him in glory eternally. The Fragrance of Life. . .
Every morning when I get ready for the day I take a second to spray on my favorite perfume. It took me a long time to pick this perfume, for several reasons. First, it had to be one that didn't give me a headache, which ruled out the majority of perfumes. After that, I wanted something that smelled fresh. . .like oranges and flowers. I sampled several fragrances before narrowing down to this one perfume. The final test was if my husband like it. He didn't, he loved it! When I walk past him in the morning, he will inevitably comment on my fragrance. It is a smell he now indelibly associates with me. The temptation with perfume, especially one you love, is to wear much more of it than necessary. I read once that you should wear just enough to let others get "a whiff" of it and desire to come closer to smell more. Once we come to know the Lord, and His Spirit lives in us, we each carry His "fragrance" about us. As one preacher described it, we have "the fragrance of life." Each person we meet will somehow, deep in their spirit, be touched by this fragrance. Whether we speak openly of our faith or not, the fragrances of the life of Christ within us will waft out to others. How we live will then either confirm or contradict this fragrance. Like the sweet smell of "baby" on a newborn, it is inescapable. May the way we live always confirm to others the fragrance of Christ living in us and leave them with the desire to draw closer to the Lord for more. Have you ever wondered why Satan sought out Eve to tempt rather than Adam? Or why the Lord made a point of telling us "the serpent was more subtil than any beast of the field. " Satan is a creature of nuances and subtleties. He tempts best by using an indirect method, dancing around the truth, distorting it, discoloring it. Or as one very wise young man once told us, "Satan makes wrong things seem right and right things seem wrong." This is an important concept to understand because women are also creatures of nuances and subtleties. Women can tell more from a conversation by what is not said than by what is. We can judge body language and the nuances of inflection, the tilt of a head, the slight pause before a phrase. Especially when communicating with other women, we can almost seem to read each others minds. It is no wonder Satan sought out the woman, whom he could read "like a book" and play like a hand of cards. Satan is no less at work in our marriages today than he was in Adam and Eve's. He uses the same subtle tactics, and like it or not, he still tends to favor tempting the woman first. If he can put the root of bitterness and dissatisfaction in the woman, he has just about won the battle, not just for the woman, but for the whole family. By destroying the woman's ability to or desire to communicate with her husband, he has crippled that Christian marriage. You see, men are do not speak the language of nuance. They are direct. They tend to speak what they think and think what they speak. This is men-speak. If our husband was French, and barely spoke English, we would be sure to explain things very clearly and directly to him in a way he would understand. Yet, how often do we avoid speaking clearly and directly to our husband about the things that bother and upset us the most? For years, it has bothered me immensely when my husband would leave the windshield wipers on after the rain had stopped. I hated the sound the wipers made scraping across the windshield. I might say something like, "The rain has stopped." He would probably answer in the affirmative, but not touch the wipers. Eventually, I got to the point I would reach over and turn the wipers off myself. I thought that would surely that would show him how I felt about the wipers staying on. No, it just meant that every time I had to turn the wipers off myself. When I finally told him that the sound bothered my ears and I hated to hear the wipers on when there was no rain, he began to make a point to turn the wipers off. He never had a clue before that (even though I had given him plenty!) that it was an issue with me. Just as women don't speak "direct", men don't speak "subtlety". This means that when they have something to tell us, they just tell us. Often our sensibilities, used to the nuances of feminine conversation, are offended by the directness of man-speak. We think they are being rude, or brusque, we can even get our feelings hurt. This is one reason why some women would rather spend time with their girlfriends than their husbands. If this is you, or you think this may be you, I can assure you that the Lord intended your husband to be your greatest friend and companion. Our relationship to our husbands is a portrait to the world of the relationship between Christ and the Church. If you find you would rather be with your girlfriends than your husband, first confess that to the Lord and ask His forgiveness. Then, ask the forgiveness of your husband as well. Ask the Lord to redeem and repair the relationship with your husband and give you back the friendship and closeness you once shared. Because we are not fluent in men-speak, and because we are so used to reading more into a conversation, we automatically think there is more to what our husbands are saying than there actually is. If he tells me he doesn't like my blouse, I assume he doesn't find me attractive anymore. When in reality he was just saying he didn't like my blouse. But remember we have that enemy who wants to convince us that our husband feels and thinks things which are not true. I can almost hear his temptation now, "Hath your husband said he finds you attractive? But he did say he didn't like that blouse! You see, he doesn't like the way you look anymore." The Apostle Paul warned us, "(For the weapons of our warfare are not carnal, but mighty through God to the pulling down of strong holds;) Casting down imaginations, and every high thing that exalteth itself against the knowledge of God, and bringing into captivity every thought to the obedience of Christ;" (2 Corinthians 10: 4,5). We must actively seek to bring all our thoughts and imaginations into captivity -- not let them roam around, but bring them under obedience to Christ. The battlefield for our marriage and our family begins in our own minds. Our very thoughts about ourselves, our marriage and our spouse must be thoughts that agree with what the Scriptures say and the will of the Lord Jesus. Next week we will look at two important things we should be saying in our marriages. The Friday entries of The Powder Room will be dedicated to communication between husbands and wives, viewed through the context of the Scriptures. Called The Language of Love, we will discuss the Biblical description of marriage and why so many loving Christians find trouble in marriage. It is a very painful thing for many Christian couples. They truly know the Lord and are committed to sharing a life that is pleasing to Him, then shortly after their wedding, the unbelievable happens. Disagreement and difficulty crop up with the very person to whom they have just vowed to "love, honor and cherish" for the rest of their lives. Suddenly, "the rest of your life" begins to look very long indeed. Perhaps it is just the top of the tube of toothpaste, or where to put the frying pan in the kitchen, but little annoyances and irritations seem to occur almost daily. Left to ferment and grow, these little annoyances will soon become big issues. The problem, however, is not in the little issues, it is with the process of dealing with the issues. Today we will look at the first reason why we as women have difficulties in our relationships with our husbands. The Scriptures give us several clues, and we will turn often to the first few chapters of Genesis as we explore the relationship between husbands and wives. In Genesis, we see Adam was created by God and placed in the garden of Eden, where the Lord gave him a decree he should not eat of the tree of the knowledge of good and evil. Then the Lord caused a great sleep to fall upon Adam and He created Eve from the rib out of Adam. Eve was created to be a perfect complement for Adam in every way, in fact, Adam said of her, "This is now bone of my bones, and flesh of my flesh," (Genesis 2:23). Down to her very DNA, she was his perfect match with a union so complete that the Scriptures describe them,"Male and female created He them; and blessed them, and called their name Adam, in the day when they were created," (Genesis 5:2, emphasis mine). Apparently, a perfect marriage. When Satan said to Eve, "Hath God said. . .", who was he really maligning? We have no reference that Eve ever heard God give a decree about the tree in the garden. Adam surely told Eve of the decree and in asking the question "Hath God said. . .", Satan was attacking God and attacking Eve's marriage, perhaps by maligning her husband. The seeds of doubt, distrust and dissatisfaction are tiny, but grow a great and mighty tree in a marriage if allowed to continue. Satan was waiting for Eve at the tree of temptation and dear sister, he is waiting for us, too. Satan is at work in our marriages today just as he was in Adam and Eve's. He uses the same subtle tactics, and whether we like it or not, he still tends to favor tempting the woman first. If he can put the root of bitterness and dissatisfaction in us, he has just about won the battle, not just for the woman, but for the whole family. We must remember, that we live in a world where we battle, not against flesh and blood . . .not against our flesh and blood, "but against principalities, against powers, against the rulers of the darkness of this world, against spiritual wickedness in high places," (Ephesians 6:12). Knowing that many of the difficulties and disagreements in marriage arise, not from our spouse, or even from ourselves, but from a deceitful enemy who desires to devour us, is the first step in rightly seeing our spouse as the Lord calls us to and then taking the action He has called us to as godly Christian wives. Next week we will begin to look into the "language of love" and how men and women communicate differently with each other. Read more about this topic at The Special of the Day. . .From the Orange Moon Cafe. Image by Randy Son Of Robert via FlickrSitting at a local coffee shop, I overheard one of the girls who worked there say to herself, "Mommy and Daddy are gonna love me even more now." She had just finished grinding a pound of coffee and was closing up the bag, presumably to give to her parents. It struck me as she said it, that I can remember thinking the very same thing about my parents at some time. It seems we all seek for love and approval. . .from a parent, a spouse, a sibling, a boss. What machinations we will go through to receive that recognition that we "are loved". There is one thing we can know, however, and that is we don't have to do anything to be loved by God. In fact, "We love Him, because He first loved us." (1John 4:19). He loves us no matter what our state. "But God, who is rich in mercy, for His great love wherewith He loved us, Even when we were dead in sins, hath quickened us together with Christ,"(Ephesians 2:4,5). What a wonder that the God of the Universe would love us, would love me! What a miracle, what a comfort, what a joy divine! For many months I have been considering writing about the relationship between husbands and wives. Having written and spoken on this topic in the past, it is something about which I have very strong views. Through the suggestion of a friend, I recently had the opportunity to read some writings by Sabrina Beasley on the same topic. Her views were so similar to my own, I was inspired to post my thoughts. Beginning November 5, 2010, the Friday entries of The Powder Room will be dedicated to communication between husbands and wives, viewed through the context of the Scriptures. Called The Language of Love, we will discuss the Biblical description of marriage and why so many loving Christians find trouble in marriage. Ye Ask Amiss. . . When I was a teenager, I was the youngest of four children and all of my siblings had flown the nest. Left alone with my parents, I longed for the company of a younger brother or sister. Image by CONFUSER via FlickrI asked, in fact begged, my parents, for a sibling. At that time, our country had been engaged in the Vietnam War for many years and the television screen was often filled with the images of young Cambodian, Laotian and Vietnamese children who could be adopted. 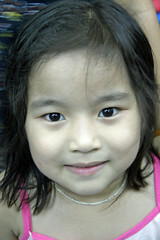 I suggested to my parents on more than one occasion that we adopt one of these beautiful children. My parents were then forty-seven and fifty-four. With all four children out of "childhood" and with an empty nest clearly in sight, I'm sure adopting a child was the last thing in their minds. I couldn't understand it then, but now, with my youngest nineteen and myself the age as my parents were then, I certainly do now. It reminds me of how often we may ask the Lord for things in our lives, thinking we are asking for the right things, perhaps even noble things. But in His infinite wisdom, He knows it is not the best thing for us. He doesn't affirm our request, not because we haven't asked with sincerity, or because we were wrong in the asking, but because we asked amiss. It is important for us to remember there are things working in our lives, and the lives of others, we cannot understand, we cannot know. Granting every desire, removing every hardship or answering every question, would remove every aspect of faith in our lives. The most important purpose of our requests and supplications must be that the Lord's eternal purpose in Christ Jesus be accomplished, that His will be performed and the Lord Jesus be glorified in and through us. When those things prayers are answered, "all these things will be added". by the Holy Ghost which is given unto us."